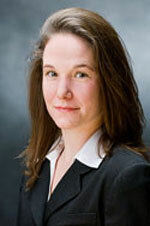 Colleen M. Tarpey is a Senior Attorney at Garfunkel Wild, P.C., which she joined in 2001. She is a member of the firm’s Litigation and Arbitration Practice Group, which represents clients in all phases of civil litigation before both state and federal courts, as well as alternative dispute resolution bodies. Ms. Tarpey’s practice includes litigation for hospitals, physicians, and other health industry clients. She also handles general commercial litigation for clients of all kinds. In addition, she handles estates and trusts litigation, including will contests, contested administration proceedings, kinship hearings, will constructions, and accountings. Prior to joining the firm, Ms. Tarpey worked as a litigation and intellectual property associate for the firm of Pillsbury Winthrop, LLP. She is a member of the American Bar Association, the New York State Bar Association, and the Nassau County Bar Association. Ms. Tarpey received her B.A. in philosophy from Hartwick College in 1994, and her J.D. from Hofstra University School of Law in 2000.